The days fly by and we're stressed to come up with any extra minutes. But what if we could free up our schedule and finish our to-do lists? Some people are just busy with little or no recourse, but others are wasting time without even knowing that it's happening. Here's a look at a few ways we can be more aware of our time and be better managers of it. You may work a job where you must have email up on a constant basis. But if you don't, there's no reason to run it when you aren't waiting on a particular message. If you're working on a project, just close your email and check them periodically throughout the day. Avoiding that catchy little "(1)" that often distracts your train of thought can save you a lot of time. In some cases, listening to music can help pass the time when engaging in mundane or mindless tasks. But when it comes to work that you need to think intentionally about, like crafting a sales pitch, writing a report, or even just reading something, music can slow you down, thereby increasing the time spent on the task and decreasing the resulting quality of your work. In some cases, you need to spend money to make money. But paying for lunch is often a double-figure investment and can cost you close to (or more than) an hour of work. Pack a lunch instead of eating out and you'll get back an hour's worth of pay, which can really add up. It might seem counterproductive (or even impossible) to stop what you're doing at work or home to take a break. However, numerous studies have shown that taking a break, or even a short nap, can actually boost your productivity and increase the quality of your work output. Even if you can remember everything you need to do, making a to-do list can help you focus by streamlining your schedule and giving you a failsafe to avoid forgetting important tasks. Tablets and smartphones can be excellent productivity tools. But when it comes to taking notes or quickly writing down ideas, you may be better off with the much simpler pen and paper. It's becoming increasingly common for meetings to be viewed as productivity killers. That's not to say they don't have their place, but a brutally objective view of the typical workplace meeting shows us that we're wasting a lot of precious time. It's not to say that all work-related classes are a waste of time, but a lot of the information that used to only exist inside classrooms now exists for free on the Internet. Particularly when it comes to technology-related topics, you can learn almost everything there is to know in a free, online format. Places like Khanacademy and Code Academy are great places to start. A lot of people find dual monitors to be more productive because it allows them to avoid having to switch back and forth between different applications or documents. While that's true, it only applies in certain professions. For example, graphic designers and programmers will often have need for more than one screen. But if it's not an obvious necessity, more than one monitor often makes things more distracting because it tempts you to put something that's not work-related on the second screen. In most cases, it'll be more efficient to stick with one monitor. One incredibly simple thing you can do to save time before you go to bed is set your clothes out for the next day the night before. It makes early mornings a lot quicker as it gets you out of your bedroom without having to search through drawers, possibly in the dark out of fear that you'll wake someone up. There's no question that it's easy to crowd our lives with obligations and tight schedules. But there is time to be saved if we're willing to be objective about our own scheduling and work habits. 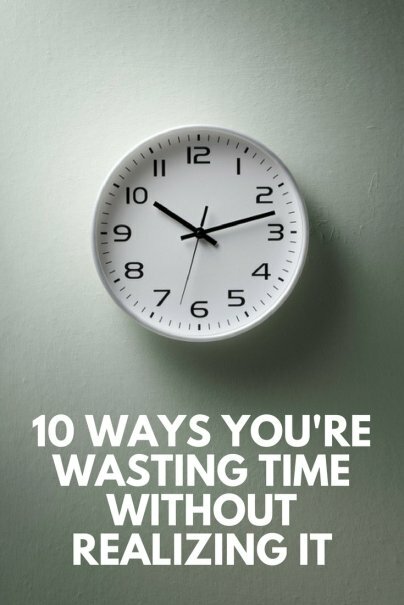 If we remove the unnecessary time wasters and get specific about where we can get be more efficient, most of us can get back more than 60 minutes a day. For many, that can make a huge difference by allowing them to be more focused, relaxed and allow them to feel less rushed every day. How do you conserve and avoid wasting time? Are the tactics you employ at home and work much different? Let me know in the comments section.